CEDAR CITY — Anne Leavitt, along with her husband Dixie, have long had a love for Southern Utah University and the community of Cedar City. They both attended SUU when the school was called Branch Agricultural College, and they said they attribute their knowledge and success to the education they received there. Leavitt will address SUU’s class of 2018 Friday at 9 a.m. as keynote speaker for the university’s 119th annual Commencement Ceremony at the America First Event Center. Leavitt came to attend what is now Southern Utah University in 1949 and joined a student body of 443. A farm girl from the tiny town of Loa in the Capitol Reef country of south-central Utah, she had excelled in the language arts, music and theater at Wayne High School and would continue to thrive on the Cedar City campus for a year before marrying and starting a family. She and her husband began an insurance business that has grown to be among the country’s largest privately owned brokerages. They also raised six sons who have embodied their parents’ commitment to service. The Leavitt family now includes 38 grandchildren and 44 great-grandchildren. Leavitt’s contributions to Utah and its people include membership on two state task forces and leadership in the Utah Endowment for the Humanities, for which she was the first chairperson. She also served on the board of the Utah Shakespeare Festival, an agreeable corollary to her portrayal of Ophelia in a campus production of Hamlet in 1950. Over the years, she and her family have contributed to the university in funds and service. In 1978, she returned to school to earn a degree in English and Spanish, graduating with honors. She wrote “Southern Utah University: The first hundred years, a heritage history,” which was published in conjunction with the 1997 centennial of the university. Leavitt also gives speeches across the western U.S. on a variety of subjects and specific topics. 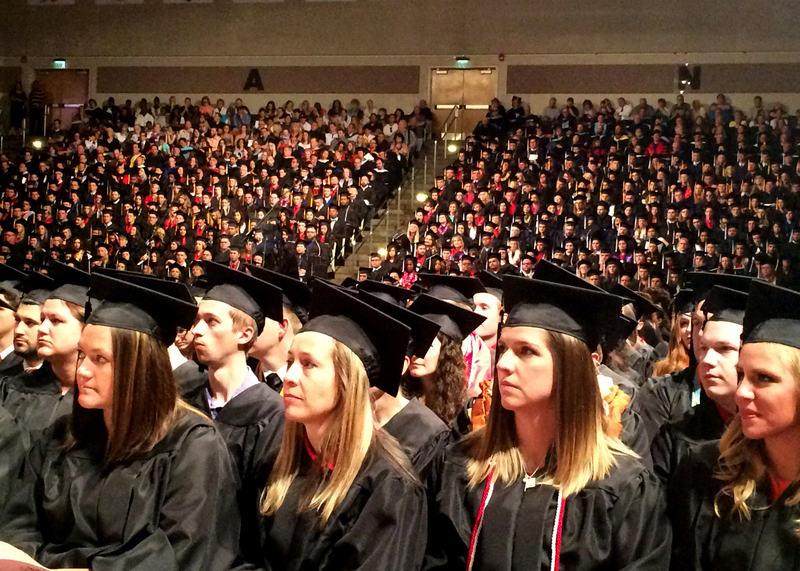 What: Southern Utah University commencement exercises with commencement speaker Anne Leavitt. When: Friday, May 4, 2018, at 9 a.m.
Where: The America First Event Center, 351 W. Center Street, Cedar City. Details: Open to the public. More details are available at the commencement website.